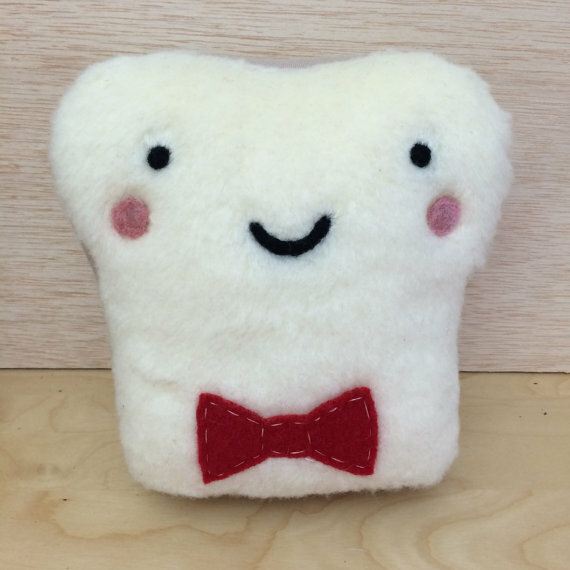 This item is an adorable Stuffed Needle Felted Toast-of-the-Town plushy pillow, featuring a loveable face with a handsome bow tie in the spirit of the beloved Dr. Who! My teen son is a B.I.G. Dr. Who fan, and politely suggested I make up a Dr. Who style toast, and here he is. Select whether your Mr. Toasty will have a red or zebra print bow tie. Either are made of upcycled fabric, the red from recycled felted sweater fabric, and the zebra is repurposed fake fur. I will make him up for you just as you like, and he is guaranteed to be your ever-lovin’ sidekick. This Toasty is created on fluffy felt fabric, and all details are securely needle felted in place. No eyes or nose to pop off for the wee ones to swallow. He is stuffed to the brim, so soft, cuddly and fancy. He should be spot cleaned or gently washed in a bowl of warm soapy water, and placed in a sunny spot to dry. Please- no machine washing! He will come with a descriptive care label attached to his handsome self.